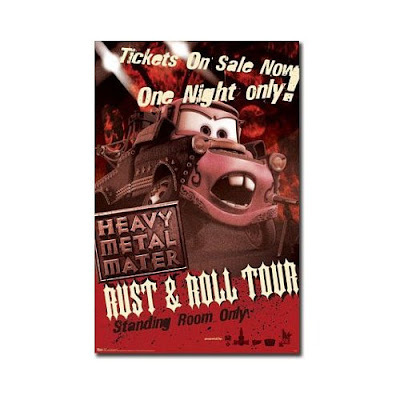 On the Disney Channel, "Heavy Metal Mater" premieres later tonight. It's the last short before the DVD/Blu-Ray release of "Cars Toon: Mater's Tall Tales" on November 2 with two additional shorts. I am sooooooo sick of Mater. I realize that maybe I feel that way because I'm not an 8-year-old boy...but I can enjoy other Disney and Pixar characters, so I don't think my age is a factor. Cars was a screaming bore. Mater was as funny as nails on a chalkboard. Hope he takes a one-way trip to the junkyard REAL soon. Honor, what is your motive here? Planes isn't being done by Pixar, and has nothing to do with Cars other than they are anthropomorphic machines. This is like saying Over the Hedge is the same as Finding Nemo because they're both films with animals. I'm curious why you don't distinguish these two as separate. The "Planes" films are being done with the blessing of Pixar and the supervision of Lasseter. They take place in a world with the Cars world, if you remember there are other vehicles in the film. This is their story. A story for boys (Think of this as the boys version of Tinker Bell). And if it's successful (most likely) then get ready for Ships, Trains and other characters in this world. There is no motive here. You're reading into this your own bias, not mine. The man that created them is backing these films? The only misconception is that you know what you're talking about. Lasseter is in charge of these. HE CREATED Cars. He's guiding them. The folks that work at Pixar have no problem with these being made, especially the guy in charge. All that ws being asked was the distinction between Maters Tall Tales being animated by people within the Pixar building (or Canada in future probably), whereas Planes will be animated by people in India. Thats quite fair to distinguish, as to some it will matter. But thats only to people who care about where something is actually animated - i.e. internal\external, Disney\Dreamworks etc.. It doesn't necessarily say much about quality, or whether they are approved by Pixar folk\Lasseter himself. Neitherway is really the style of this blog. Adding that would be too wordy for a tease.